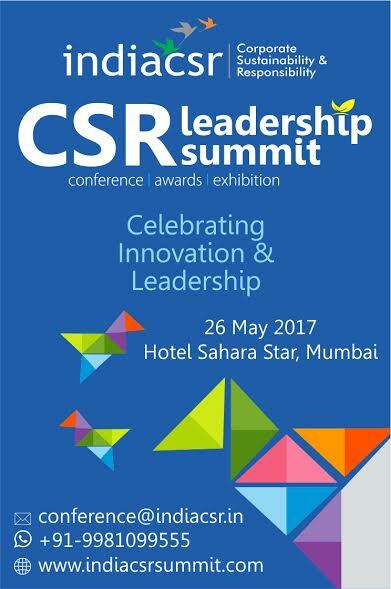 Mumbai: The prestigious India CSR Leadership Summit & Awards 2017 ‘Celebrating CSR Innovation & Leadership’ to be held at Hotel Sahara Star, Mumbai on 26th May 2017, Friday. The day long forum will witness vibrant political leaders, CSR think tanks, thinkers, social reformers and Govt. officials. It would be one of the biggest CSR knowledge and idea sharing forum in the year 2017. The features of the forum include: Keynote Address, launching of Book on CSR Practices of Award Winning Corporate and NGOs, launching of CSR books by various authors, India CSR Awards for CSR Innovations, Exhibition and Partnership and Networking Tables and 300 leaders from more than 200 organizations. Leading corporates will be honoured for their outstanding contributions to the national progress in the domain of CSR at the forum. The occasion will honour more than 20 organizations for their CSR innovations towards outstanding contribution to the nation progress under various categories. Business leaders and CSR leaders, CSR Authors will be also recognized for their outstanding contribution to the field of Corporate Social Responsibility. India CSR Awards is one of the prestigious recognitions honouring the outstanding and innovative CSR, Sustainability and Social Enterprise Projects and leadership in CSR. This year’s theme for the summit is ‘Celebrating Innovation and Leadership in CSR’. The Award has been instituted to recognize the innovative CSR Practices in India and this is the 5th edition of India CSR Summit & Awards. “CSR has become a key benchmark of corporate performance and emerged as one of the most dynamic fields nowadays in India and across the world. Meeting some standards in CSR is a mandatory requirement for certain sizes of companies in India with special reference to amended Companies CSR Law.”, said Rusen Kumar, Founder and Managing Editor, India CSR Network. “We are inviting most valuable speakers to grace the summit and illuminate us with their experience, expertise and vision of the new age CSR that would facilitate transfer of knowledge across the august gathering. Summit will also give big boost to the CEO agenda of CSR. ”, said Dr Rana Singh, Co-founder and CEO, India CSR Network. Forum will honour leaders from corporate, NGO, social enterprise and individuals in below mentioned categories: CSR Life Time Achievement Award, CSR Person of the Year Award, CSR Professional of the Year Awards, CSR Manager of the Year Awards, CSR Author of the Year Awards, Women CSR Leader Awards, Philanthropist of the Year Awards, Social entrepreneurs of the Year Awards, Green Leadership Awards, NGO Leadership Awards, Sanitation Leadership Awards (Corporate), Sanitation Leadership Awards (Individual), NGO Category: CSR Implementing Partner Awards.